I am very happy that the barometric pressure is rising. We had an Alberta Clipper last night and earlier today, and the pressure dropped. Falling barometric pressure can help trigger labor. And last night, I started having contractions. Not big proper ones, just the very early ones that feel a bit crampy but don’t really feel like your entire uterus is engaged. And the bump and I discussed this, and I explained that this was not acceptable behavior. And then we went to bed, and I was able to sleep through the contractions, which is absolute proof that they were nothing to worry about. But the weather is clearing, and the contractions have pretty much abated. I’m back to the regular discomfort of being 38 weeks pregnant. I slept in this morning! And by that I mean I managed to sleep past 7. I really can’t do this on work days because otherwise I can’t find a parking space that’s not a hike across the parking lot. (See #1 for why I don’t want to walk any farther than is necessary. We are not encouraging labor!) And my hips start to hurt, so that even on the weekend, I find myself waking up by 6:45 and unable to fall back asleep no matter how tired I feel because there is no longer any comfortable position in bed. I’m registered for this year’s Medieval Congress. It starts the day before I’m scheduled to go back to work (as long as the bump remains cooperative). This means I’ll have to miss the second day of it, but that’s okay. It will be interesting with the wee one in tow. If this is not a fussy baby, we should both be able to sit in sessions, and if it is a fussy baby, my mom and I will tag team. Courtney has bought Pretend Soup for her daughter. My mom and I found this cookbook (and it’s companion Salad People) at the library some years back and fell in love. It’s written specifically for cooking with preschoolers and has some wonderful recipes. The best part? Courtney was all excited to tell me about how she’d found this cookbook to buy, and I was all set to tell her that the next book she needed was Pretend Soup. My colleagues are pretty nice people. I have gotten very few of those annoying uber-sympathetic “how are you doing?”s this pregnancy. Instead, people are chiming in with things like “7 days left, right?” or “how many more days is it?”. One person even said, “Congratulations. No, I shouldn’t say that yet. Good luck.” I love that he realized what he’d said and immediately corrected himself. Now they just need to learn to treat all pregnant women this way, not just those who’ve suffered a loss. 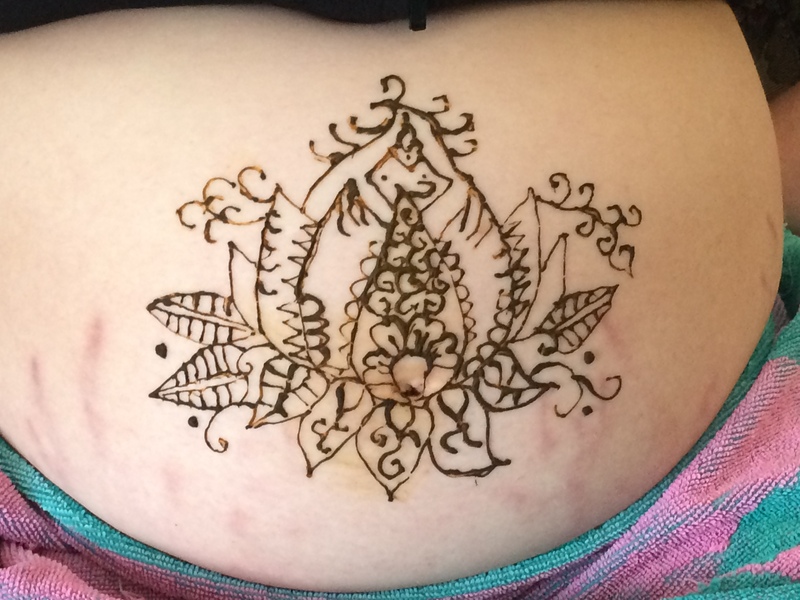 Last Sunday, a small group of us had a henna party. Sheri graciously provided the henna and the artistry. She did an awesome job, and my tattoo is still going strong. This photo is from during the party, but it shows up better than the photos taken later because the henna is, of course, darker than the stain. And finally, I procrastinated about writing this, and I’m glad that I did. I decided I’d listen to Ask Me Another on NPR first. And this week’s episode… Well, it’s always funny, but this one was particularly good. At first I was just going to share the game in which they rewrote “Cat’s in the Cradle” to make it about various childhood games, but there was much more to the episode that had me in stitches. Enjoy.